Up and down the East Coast people are bundling up and digging out after yesterday’s winter storm. After shoveling and, in some cases, re-shoveling driveways, sidewalks, and street-parked cars, most of us retreat back indoors to warm up with a cup of tea and wait for the sun to begin its melting magic. For too many people, however, a warm home is not a guarantee. Some lack access to sufficient heat in their homes while others are without homes all together. For those of us fortunate enough to have a cozy place to return to there are a few simple things we can to help others through the cold months. Donate your gently worn winter coats and clothes. We all have an extra coat in the closet -- one we hang on to but rarely wear. Why not donate it through a coat drive to get it into the hands of someone who will wear it this winter? Local organizations, thrift stores, and houses of worship are great places to start. And, while you’re sorting through your closet, why not pull out the sweaters, hats, scarves, and gloves you’ve kept but don’t wear anymore? Prepare and serve a hot meal at a local shelter. Homeless shelters are often busiest during the coldest months of the year when more people come in looking for a hot meal and a warm place to sleep. Reach out to your local shelter to see what you can do to help. Perhaps they need more groceries to serve an increased number of clients or an extra hand serving meals throughout the week. Support your local human services organization. The winter months and extended cold snaps can result in unexpected heating costs which can be crippling for some low and fixed-income families. Often local human services organizations have funds set up to help. Contact your local organization (you can use our Advanced Search Tool to help you find yours) to see what programs they are running to help your neighbors in need.A donation to one of these funds or programs is often greatly appreciated because resources tend to deplete quickly. The holidays may be over, but that doesn’t mean the season of good will needs to end. While we’re sipping our tea this winter let’s remember those who may be seeking warmth and do what we can to help. 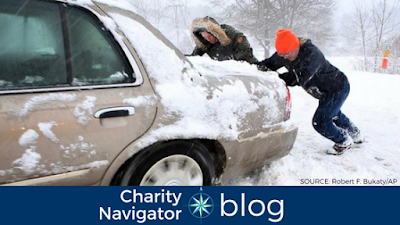 You can use Charity Navigator's Advanced Search Tool to find a local charity helping your neighbors stay warm this winter.